In commemoration of Amritavarsham50 and Amma’s life of love, compassion and selfless service, India’s Postal Department issued a special cover [envelope] and cancellation stamp on 27 September, the day of Amma’s birthday itself. 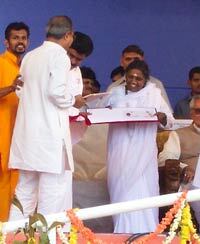 The stamp was handed to Amma by Shri. S. Thirunavukkarasu, India’s Honorable Minister of State for Communications & Information Technology.